Paper Jamz Electric Guitar and Drum Set for My Budding Rock Star! My five-year-old son loves playing with musical toy instruments. Right now, he has a toy guitar, xylophone, flute and a drum set at home. He wants me to buy him a harmonica, too. I’m not surprised that my son is musically inclined because his lolo (grandfather) used to be a drummer in a band. This explains why my son was really happy to see the Paper Jamz electric guitar and drum set delivered to our doorstep for review last Monday. The first thing we noticed about these Paper Jamz toys is that they’re very light and super thin, so kids won’t have a hard time carrying these instruments. That’s because these instruments are made of paper and cardboard. My son wasted no time in trying out these musical instruments. He played the electric guitar first then the drum set. You probably won’t believe it, but he was playing these instruments for 3 ½ hours straight on the day that these toys arrived! They are also the first things he looks for when he wakes up in the morning and when he comes home from school. That’s how crazy he is about these toys! The Paper Jamz electric guitar has no strings. 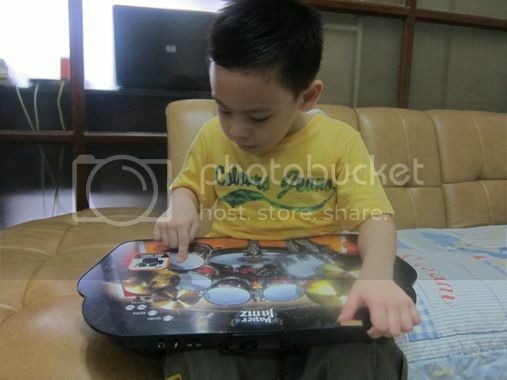 Instead, the guitar uses Active Graphics Technology, which allows kids to play it by simply touching the surface. The Paper Jamz drum set plays like real drums. Its touch-sensitive sensors allow it to recognize multiple touches at once. The Paper Jamz electric guitar and drum set have an internal speaker, three songs and four modes for jamming, namely: Perfect Play, Rhythm, Freestyle and Karaoke. Also, both instruments are ultrathin, so storing them after use won’t be a problem. These toys are ideal for boys and girls aged 8 to 12 years old. These musical instruments are available at Toys R Us and Toy Kingdom. 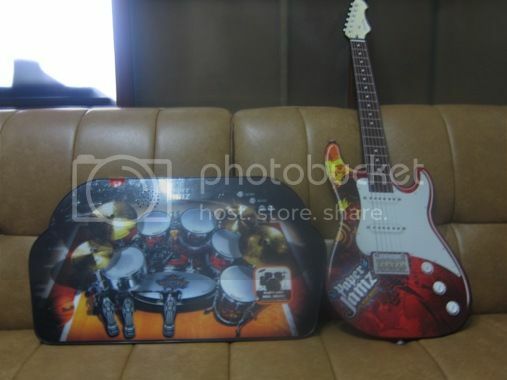 The electric guitar costs Php1,999.75, while the drum set costs Php1,799.75. 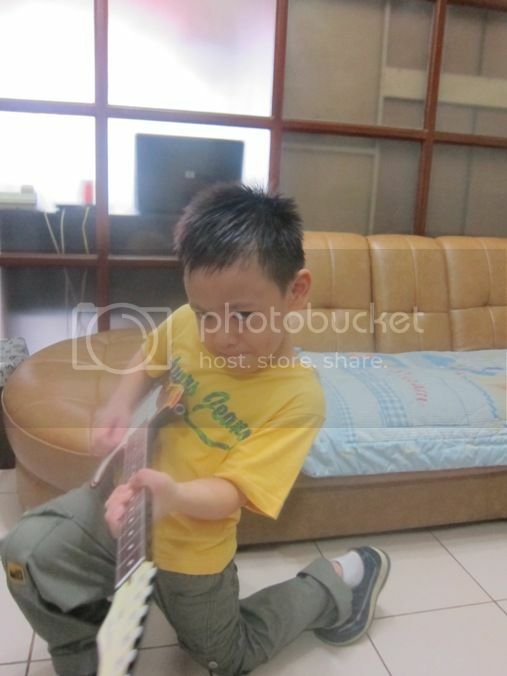 So, did my son enjoy playing the Paper Jamz electric guitar and drum set? Absolutely! This entry was posted in Musical Instruments, Musical Talents, Paper Jamz, Paper Jamz Drum Set, Paper Jamz Electric Guitar. Bookmark the permalink. 9 Responses to Paper Jamz Electric Guitar and Drum Set for My Budding Rock Star! 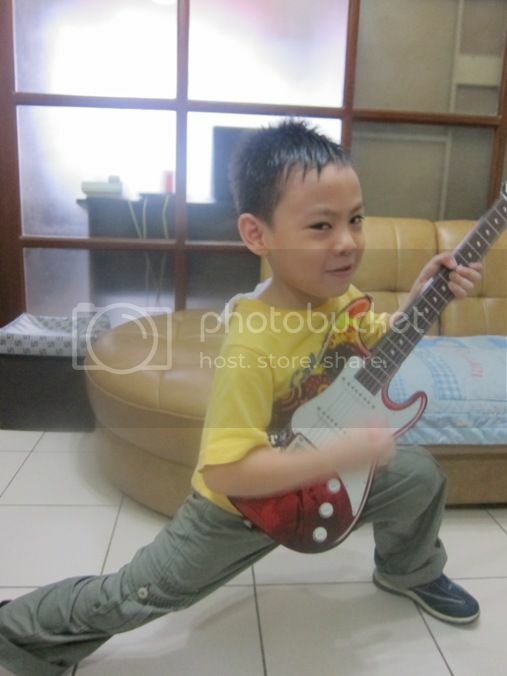 Quite expensive for my budget but sure looks cute on your budding rock star! Your son is so cute! He plays the part of a rockstar so well! He looks like a pro! Go! Justin! enjoy what you like to do and have fun with it!…God bless you!